Bock beers have a well earned reputation as wonderful, if not occasionally misunderstood, beers. Glorious Maibocks help us welcome back warm days and outdoor drinking in the spring. Sturdy bocks and doppelbocks keep as from starving during our 40 days fasting for lent (you do stop eating for lent, right?). The fact that these big malty brews are lagers often gets missed by the non-trainspotters of the beer world,but nobody should worry about that. And in fact, that’s not a hard and fast rule, with some variations and sub-styles being top-fermented ales. It’s understandable for people to assume that these dark, malty, complex beers fit into their concept of ale, not lager. And while they are not modern hop bombs, even the most ardent hop-head might find themselves quietly sipping a bock at the end of a long day, enjoying the sweet spicy brew. This time of year, it’s not unusual to find a brewery producing a bock. They are generally released in fall, stick around for the holiday season and through till Easter, where they are perfect with the big seasonal feasts we generally over-indulge in. Historically, this was because of that whole fasting thing, getting yourself good and forgiven before a big Christian feast. Now bocks are seen more as celebratory beers perfect for the actual feast, rather than the fast leading up to it. And while our GTA winters probably aren’t as epic as the northern German winters where these beers first started popping up, a bock at the end of a cold day is as welcome in Toronto as in Einbeck. 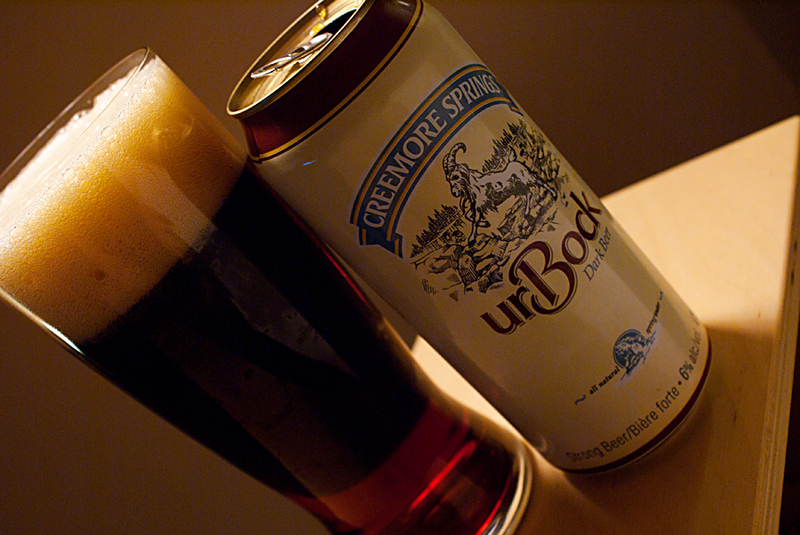 From a 473ml tallboy, urBock (“ur” is the German word for “original”) pours a deep chestnut brown with brilliant glimmers of ruby at the edges. About 2″ of rocky head dropped fairly quickly to a dense 1/4″ layer of foam that left a heap of lacing on the glass. Aroma is big malts. Smells caramelly like Munich malt, with brown sugar and toffee. There is a grassy hop and a bit of earthiness as well. Taste is malty as well, though I’m surprised with how much hop influence there is. Immediately there’s that Munich-esque sweetness, with some brown bread like graininess, but through the mid palate I actually get a fairly herbal/grassy hop hitting on hay or even green tea. While there is a bitterness left on the sides of my mouth, the finish is a lingering sugary sweetness, with just a trace of alcohol warmth. The medium body is balanced somewhat with a nice carbonation, but it’s definitely not a chugging beer. A really great brew for the cooler nights we’re getting, or paired with a hardy stew or cut of meat. Currently at the LCBO (#219659) and The Beer Store (http://www.thebeerstore.ca/beers/creemore-urbock), as well as bars throughout Ontario. Well, like I said, a nice cut of meat. Hey, it’s moose hunting season. Know any hunters? Did they have a productive hunt? Maybe some moose, like a tougher shoulder cut in a stew. With the usual suspects of root veg and a good beer for stewing, it could be a match made in heaven. Cheese is actually a bit trickier, but I’m going to say an Oka. The slightly fruity and nutty cheese will hold up against the sweet malty beer, with neither of them over-powering the other. Established in 1987, Creemore Springs is one of Ontario’s original craft brewers, taking great pride to make beer the old fashioned way. Brewed in small batches, in an open flame copper kettle with its own local spring water, the finest barley malt, imported noble hops and select yeast. No additives, no preservatives, no pasteurization and no compromises. Just good old-fashioned pure, natural beer. That’s why consumers seek out our four distinct beer styles at fine establishments everywhere. The brewery is located in a century-old hardware store on the main street of the Village of Creemore, ON. Visitors are welcomed with beer tastings, brewery tours, a charming beer store and small town hospitality. For more information visit www.creemoresprings.com.